Skirlie is one of my favourite dishes, it's really a side dish or a Scottish stuffing - but I could eat tonnes of the stuff! It's great to use as chicken or turkey stuffing and tastes even yummier when it soaks up the bird's juices. It is also a great addition to mince and tatties or stovies. The name comes from the way it's cooked - skirled in the pan. Many families in Scotland will have their favourite skirlie recipe as a Christmas turkey stuffing and many Scottish butchers sell it with pigs in a blanket (small sausages wrapped in bacon) with their Christmas turkey packs. The book Scots Cooking: The Best Traditional and Contemporary Scottish Recipes by Sue Lawrence compares the hissing noise in the frying pan as the skirl of the pipes. Sue suggests serving Skirlie with Champit Tatties. Christopher Trotter calls skirlie a good gravy soaker upper in his National Trust for Scotland cook book The Scottish Kitchen. Skirlie is also called Scottish stuffing. The photo above is of cooked skirlie with chicken and the photograph below is uncooked. Big spoon to give to Chris to shovel it in with! An older and more traditional skirlie recipe can be found in the book The Scots Kitchen by F. Marian McNeill. She does not use butter or dripping but uses suet instead which is melted and used to brown the onions. Skirlie Potatoes are mentioned in Eating in where Sue Lawrence describes them as potatoes tossed in fried oatmeal and onion. 1. Melt the butter in a pan and add the onion, frying gently to soften. 2. Stir in the oatmeal, season and cook gently for 10 minutes. 3. Serve with Stovies and give Chris a ring! 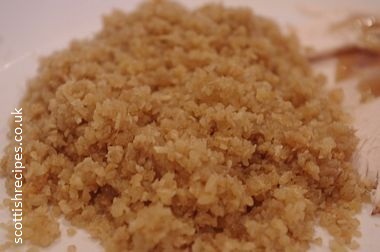 A tip from Oatnews.org is to pulse large oats in a food processor to make them smaller if you do not have fine oats since large oat flakes do not work well. The book Nick Nairn's New Scottish Cookery describes a wee bit of the history of skirlie such as how it would have traditionally been served with grouse. Nick Nairn prefers his with a range of food such as lamb or scallops. His recipe for skirlie differs slightly in that he uses bacon, beef or duck fat or dripping and medium or coarse oatmeal. An alternative recipe for skirlie is skirlie mash which can be found in the Three Chimneys Recipe Book which is suggested to serve with game stews, hotpots or roast chicken. Her skirlie mash dish from Grampian Television show Desert Island Chefs was Grilled West Coast cod and skirlie mash in saffron broth with mussels, leek and fennel. It also has a modern dish of skirlie potato cakes. Chef, writer and owner of the Three Chimneys Restaurant is Shirley Spears and she adds finely chopped parsley and chives to her skirlie recipes. She serves her skirlie potato cakes with venison. The Book Maw Broons Cookbook has a skirlie recipe and talks about Pa Broons love for homemdade Scottish stuffing. He loves to eat it cold with a couple of pickled eggs. Buy Maw Broon's Cookbook at a discounted price and with free delivery available. The BBC programme that accompanied the book filmed the Hairy Bikers' cooking skirlie at the Castlegate in Aberdeen and has photos of Si King and Dave Myers cooking with chef David Littlewood of The Milton in Aberdeenshire and sampling Aberdeen Angus beef at Foveran. For their skirlies recipe the Hairy Bikers' cooked Aberdeen Beef Olives with kidney gravy and champit potatoes. The book Scots Cooking: The Best Traditional and Contemporary Scottish Recipes by Sue Lawrence recommends using medium oatmeal but suggests that coarse oatmeal which is half medium and half pinhead could also be used though is will give the Skirlie a rougher and nuttier texture.